Quebec City sparkles in the winter and comes to life during the festive Christmas season. 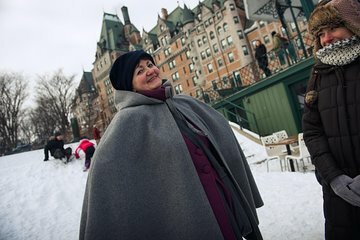 On this tour you can experience the magic of Old Quebec during the holidays. As it will be cold out, you don’t want to wander aimlessly—your walking tour guide will take you to the best winter spots in the UNESCO-listed World Heritage Site. Sample local Christmas produce and learn about the unique traditions of the city. Our guide was a historical interpreter representing the first businesswoman in Quebec (Madamme Barbel). The tour was entertaining as well as educational and took us through most of the upper and lower city ending at the Marche on the inner harbor. We were treated to hot chocolate near the toboggan run outside the Chateau Frontenac and iced apple ciders at the Marche. In between we learned about the life of the early inhabitants of the area, their religion, foods and interactions. It whetted our appetite to explore more of the city. A must for the holidays! Great informative tour in a lovely city. Guide was very friendly and took us to some very interesting places. Great tour to start off you visit . Absolutely delightful tour! One of the best parts of our weekend in Quebec City. Knowledgeable tour guide with a charming, warm personality. Don't hesitate in booking this, it's so very worth it. You'll love it.